Unless you are booking a philharmonic or a non-vocal jazz band, the show will involve words. 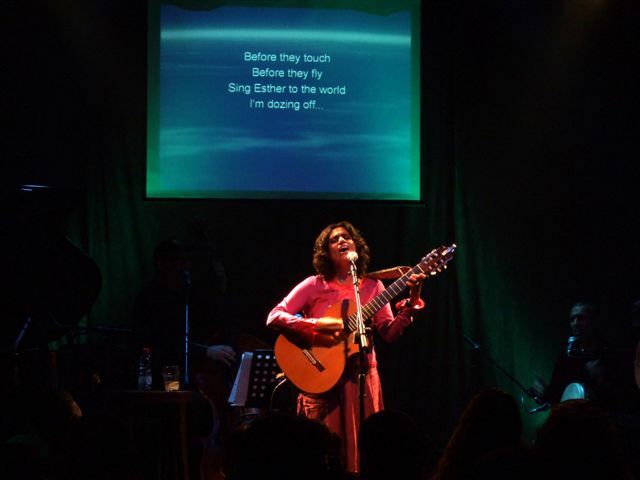 Lyrics are a crucial part of the show – listening to an Israeli artist without understanding the words would be like appreciating Van Gogh in black and white. What’s to be done? Well actually it’s quite easy, really. Make sure you have a venue with space for a screen (best is to have the screen directly above the stage), and project a simultaneous translation. Believe us, this is not hard, and has a huge impact on the appreciation of the show and the way in which the non-Hebrew speakers feel included. Insist in the contract that the band sends you their playlist at least a month ahead of time. Ask the band to send the lyrics too, but even if they don’t you can find them all on www.shiron.net . Ask a local Hebrew teacher, or local Israeli, one of your shlichim, to translate the songs for you. They don’t need to create a beautiful professional rhyming translation – after all the rhythm and sounds of the Hebrew can be heard anyway and don’t need to be replicated by the English – just something whose meaning can be caught easily. Break up the translation into powerpoint slides – 2-4 lines per slide. Take on someone whose job it will be to operate the powerpoint during the gig. Make sure this person is a Hebrew/English understander, and has run through the slides together with the music itself. As part of the whole set-up for the band, make sure the powerpoint is also set up and visible behind the stage lighting.